Home » Panag-aapoy , Sagada » "Panag-aapoy" - Sagada's unique way of remembering their departed love ones. "Panag-aapoy" - Sagada's unique way of remembering their departed love ones. Cordillera - A fire brightly burns at the cemetery of Sagada every November. Those who see this for the first time might think that people of Sagada are burning the whole mountain where they buried their loved ones by the looks of a large blaze of fire when viewed from afar. The people of Sagada have been practicing their unique way of remembering their departed love ones called "Panag-aapoy" which means "to light a fire" in English. 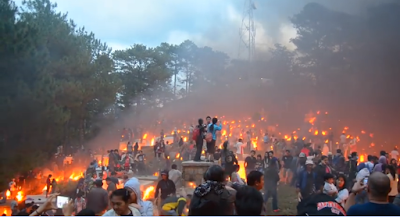 Every eve on the first day of November , many iSagadas (people of Sagada) gather at the cemetery to light pieces of a pine wood's flammable part called "saleng". If others light up candles, the iSagadas light up saleng to create a bonfire near the grave of their loved ones. This lighting up of saleng must be done before sundown and the entire cemetery is covered with a yellowish glowing fire from the saleng. Thus, one might think that the whole mountain is burning. Many iSagadas consider this event a very serious moment for every family member to commemorate the passing of their loved ones. They don't consider this event as a festival to merry but they view this as a solemn moment for them to respect their dead. Tourists visiting the place on this day must know that this occasion should not be viewed as a festival. That's why you won't find people dancing and playing the gongs. 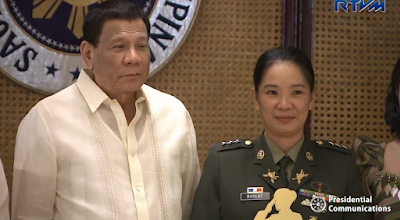 The Dap-ay and the Episcopal Church hosting the event said that promoting "Panag-aapoy as a tourist attraction without consulting them and the local government is not acceptable. It should be noted that "Panag-aapoy" is meant for the people of Sagada to honor their departed loved ones and not for tourist to take photographs and selfies for themselves.